Yella is a film about Germany-about contemporary Germany. How important it is to emphasize this seemingly banal fact becomes quickly obvious once we acknowledge the reality of the state of affairs suffered abroad by German films in the last two decades. Just recall the recent German films that managed to find major international distribution deals and even received Academy Awards accolades. With few exceptions such as Fatih Akin's films, these were precisely productions such as Caroline Link's Nowhere in Africa (2001), Wolfgang Becker's Goodbye Lenin! (2003), Oliver Hirschbiegel's Downfall (2004), and Florian Henckel von Donnersmarck's The Lives of Others (2006)-films that proved to have significant appeal for international audiences not least because they almost pathologically corroborate the ideologically convenient belief perpetuated outside Germany's borders that this nation is still almost exclusively reducible to its totalitarian past(s). Even Tom Tykwer's seminal Run Lola Run (1998)-a film equally beloved for its iconic red-headed protagonist and its stylish look-cannot really be regarded as a film about contemporary Germany precisely because of how it uses editing and mise en scène to transform the real social spaces of post-reunification Berlin into a more or less mythical, universal space that in the final analysis has rather little to do with the reunified city itself; the film, that is, could have taken place anywhere. 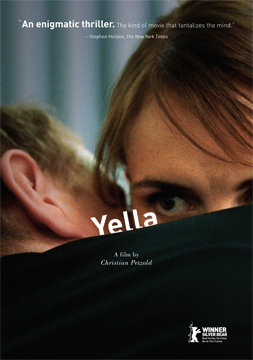 Christian Petzold's eighth feature, Yella, in contrast, is not merely about contemporary Germany but is indeed of it. In this regard Yella is not only typical of Petzold's oeuvre, which from the beginning has examined the conditions of possibility for living in post-reunification Germany, but also representative of a number of films that can be productively grouped together under the label "Berlin School." This term, popularized by various German film critics in the late 1990s and early 2000s, forges a film-historical relation among a dozen or so contemporary German filmmakers who today all live and work in Berlin. Although it is important not to eradicate the aesthetic differences that ultimately distinguish the individual 'members' from each other (some of whom view their alleged membership in this 'school' with considerable anxiety), the films by directors such as Thomas Arslan, Angela Schanelec, Christoph Hochhäusler, Benjamin Heisenberg, Valeska Grisebach, Maren Ade, Ulrich Köhler, Maria Speth, Elke Hauck, Henner Winckler, and, of course, Christian Petzold can be considered related by their efforts to present viewers with new images of contemporary Germany-images that do not already preexist in the minds of their viewers and that, as a result, actively block precisely those tourist-like viewing habits to which the better known and commercially more successful German films of the last decade shamelessly cater. In short, what the Berlin School directors and their films, of which Yella may perhaps be the group's first real masterpiece, have in common is a desire to create a cinematic itinerary of Germany's present. This desire to create an itinerary of the country's present should not, however, be misconstrued as somehow being expressive of these filmmakers' desire to deny their country's history (especially its totalitarian pasts) and instead escape into the realm of pure fiction; rather, by drawing upon the vast pool of stories and experiences to be found in Germany today, these films suggest an urgently felt need to engage the present and do so especially by positing questions about how and under what specific conditions people live through such experiences. These films are thus very much about German history, but their relationship to this history is not defined by its 'representational' quality as it is the case with films such as Downfall or The Lives of Others-films which, because they flaunt so excessively their alleged 'authenticity', demand to be measured against the accuracy with which they engage the real historical circumstances that they evoke. In contrast, the Berlin School films' relation to German history is more akin to how violent events tend to be rendered in Jean-Luc Godard's films: rather than obsessively returning to the violent event itself and actually depicting it, Godard's camera tends to focus on the effects the event had on the subjects that it affected. Likewise, the Berlin School films are not interested in depicting, say, the actual fall of the wall, nor are they keen on representing the horrors of German history, be they those perpetrated by the Nazis, the Stasi, or the Red Army Faction (the 'terrorist' group that combated the West-German state in the 1970s and 1980s); instead, these films try to find ways to image the myriad effects Germany's troubled history has had, and continues to have, on the subjectivities of the people living in Germany today. Indeed, these films appear to insist that an event such as Germany's reunification can be shown only by rendering visible its effects in and on the present precisely because an event has no existence outside of its effects. The desire to encounter how German history affects the present moment, however, commits these filmmakers to directing their cinematic eyes and ears on the interstices of German social history, that is, on the micro-histories that constitute life in the present rather than on the well-codified 'major' narratives of officially sanctioned historical and political discourses, which the German film industry keeps reproducing in a steady stream of history films. One of the most significant aspects of these filmmakers' collective effort to image Germany in the present-an effort that is collective not despite but because of the singularity with which the individual directors pursue it-is, perhaps paradoxically, that their commitment to image the present of Germany is imbricated by a sense that such a task can successfully be undertaken only based on the counter-historical premise that a German people, and a concomitant German nation, does not yet have existence. Unlike most German films of the last two decades, that is, the Berlin School looks at contemporary Germany as a new nation-for as a nation, Germany is barely twenty years old-and wonders where its people actually are: not east-Germans, not west-Germans, not Leitkultur "lets-eradicate-all-differences" Germans-but the very people that are still missing, not least because of the political failure to constitute them through a proper constitutional act after the country's reunification in 1990. The Berlin School films are thus quite literally directed at a people still missing-and hence at a people that is yet to come-rather than at a community, imagined or real, that has coherence across time and space, that is, across the ups and downs of 20th and 21st century German history/histories. Christian Petzold's work, from his early television films such as Pilotinnen (1995), Cuba Libre (1996), and Beischlafdiebin (1998), through his first theatrical features, The State I Am In (2000) and Ghosts (2005)-which together with Yella form his so-called "ghost trilogy"-has consistently investigated how this absence of an already constituted German people manifests itself in the present, post-reunification reality of characters populating and moving through the geographical spaces constituting 'Germany'. Not coincidentally, then, Petzold's films are dominated by mostly female characters (Petzold claims that he prefers to write stories about women at least partially because this prevents him from becoming overly autobiographical) who are perpetually on the move, driving in their cars, riding trains, or simply roaming through spaces that frequently lack clear definition. These spaces, or what Marc Augé calls "non-places" (Petzold cites Augé's book of that title as one of the many reference points he drew upon when conceptualizing Yella), include the seemingly endless German Autobahn-net on which his protagonists restlessly drive to and fro in smoothly running, German-engineered cars, but without ever really knowing where they're going or why they are in motion to begin with; they also include amorphous postmodern hotel rooms and lobbies, office parks, car dealerships, and coldly stylized homes, as well as the oddly depopulated urban landscapes that always appear in his films as spaces through which his characters are forced to travel rather than as locations where they would feel welcomed to socialize and forge communities. Yella, too, is full of such spaces. Characteristic of the director's work at large, Petzold's camera (which is, as always, handled by his cinematographer Hans Fromm) renders these spaces visible without providing establishing shots that would allow viewers to orient themselves and gain a feeling of familiarity and recognition-a feeling that would almost inevitably territorialize the ghost-like, shapeless quality of these non-places onto the overly familiar psychic terrain that Germany has come to assume in and through the myriad cinematic representations of its past. By refusing, however, to clearly identify these spaces-that is, by aesthetically rendering these spaces as non-places-Petzold subjects viewers to assuming a point of view that forces them to encounter these images as images of the present: the lush landscape by the Elbe river that asserts its presence sonically even more so than visually, that way calling attention to its existence in the here and now while simultaneously also evoking Japanese ghost story films and the rich psychic territory mapped out by German fairy tales; the forsaken streets of the (east-German) city of Wittenberge, which was once home to the Protestant Reformation and subsequently became a bustling industrial city, but which today shows all the traces of a city that has seen most of its youngest and brightest leave in hopes of finding a more prosperous future in the West; or the late capitalist environs of the medium-sized (west-German) city of Hannover, host of the World Expo 2000, with its many postmodern business parks and 'tastefully' designed hotels, which simultaneously exude a coldness that affectively prevents anyone from ever feeling at home in these non-places and, mysteriously, an aesthetic charm all their own-one to which Petzold's camera is clearly attracted. Indeed, that Petzold, throughout his career, has shown a penchant for revealing the aesthetic beauty inherent to these capitalist non-places is not a coincidence; rather, what fellow Berlin School director Christoph Hochhäusler calls Petzold's "technological lyricism" is the direct result of Petzold's belief that one of the major intellectual and aesthetic tasks for contemporary German cinema is to find images that render sensible the defining event for life in Germany in the last two decades. However, this event is not, as one might assume, that of the fall of the wall and the country's subsequent reunification; rather, the true era-defining event is the process by which this national moment of exuberance almost instantaneously gave way to the emergence of the supra-national logic of neoliberalism encroaching upon the citizens of a country used either to the conditions of socialist Planwirtschaft (planned economy) or social Marktwirtschaft (market economy). The intellectual and proper cinematic task Petzold sets himself (and in this respect Yella is thus far only his most explicit effort) is to find images for this new economic logic, i.e., finance capitalism-without having recourse to the worn-out clichés the history of cinema tends to rely on when depicting capitalism. Refusing to denunciate this new economic logic by falsely casting it in images that were once used in order to depict an earlier mode of capitalism, Petzold instead insists on the necessity to render finance, or venture, capitalism by inventing images for it that articulate the essential lightness, attractiveness, indeed, odd sexiness of this new mode of (economic) power. It is precisely this mode of power, which provides the conditions of possibility for living in post-reunification Germany, that the better-known German films of the last decade or so have mostly ignored, thus having completely failed to engage what it means to live in Germany in the present. This narrative structure ultimately enables Petzold to ask questions about the nature of desire in the age of venture capitalism itself. Or, to return once more to the question of contemporary Germany, what Petzold attempts to do in Yella is nothing less than to examine the logic of desire that governs the production of subjectivities in post-reunified 'Germany'. In the end, the question Yella-and, indeed, Petzold's work as a whole-asks is a simple yet crucial one: what is the relation in contemporary Germany between subjective desires and the economic logic within which such desires find their expression? The film's provocation is to suggest that the relationship between the spheres of cold, hard economics and subjectivity is one of immanence; after all, Yella's desire is not for an escape from the affective hold this economic logic has on her and her dream(s) but, on the contrary, she seeks to increase her capacity to participate in it. Her dream, her desire, is not opposed to the desires produced by venture capitalism; it is not a dream for a more 'authentic' state of being that she could find only outside of its logic: she is not nostalgic for a time prior to 1990, which is why neither her former husband, Ben, nor her beloved father embody viable alternatives to what Philipp has to offer her. But if even in our dreams we do not express a desire for an alternative to the often clearly brutal economic logic of finance capitalism-a logic that is, of course, oblivious to national borders and national desires, no matter how much opportunistic politicians want to make voters believe that, say, the auto industry in Germany is actually a German industry (rather than one owned by stock holders dispersed across the world)-then, so Yella asks, what are the consequences for the very possibility of living in the present and, ultimately, for the prospects of forging a people, a properly constituted post-reunification people in Germany? However such a people may eventually constitute itself, it seems unlikely that it can do so unless it accounts for the very mode of power that is constitutive of the content and form of desire affecting 'German' subjectivities today. If Yella's diagnosis of the state of desire in the age of venture capitalism holds up to further scrutiny, we may have to accept that, politically speaking, the only way out is through. Affirming the consequences of this diagnosis as a politically viable response to the conditions of the axiomatic logic of venture capitalism is a far cry from acquiescence or resignation, however; rather, Yella's affirmation of a politics of immanence is based on the very diagnostic attitude towards the world so characteristic of Petzold's cinema-an attitude that insists that the only way to affect the logic of venture capitalism is by paying close attention to how the affective level of desire functions as the central engine for the production of the very subjectivities that are sutured into and continue to be produced by this axiomatic. In the end, of course, Yella does not offer viewers a political program, let alone a recipe for revolution; and doing so is surely not the job of art in the first place. Typical of the Berlin School cinema at large, Yella is very much an interrogative cinema that refuses to present viewers with thesis-like answers. These films (and their makers) are too intelligent to fall into the pitfalls of a political discourse that trades in the comforting platitudes of 'committed art' that are often advocated (especially in Germany) by a left-liberal, humanist discourse of feel-good anti-capitalism. No matter how desirable the terms of this discourse may still strike one at this present juncture, the cinema of Christian Petzold, perhaps never more powerfully than in Yella, shows that these terms have lost any real purchase on this new economic logic that, notwithstanding the crisis it is currently undergoing, can hardly be regarded as being on its way out. The fact that Petzold managed already in 2006 to image why these terms are outmoded and impotent prohibits us now, however, from considering Yella as delivering a 'timely' message about the evils of venture capitalism. To put it bluntly, Yella is not a 'topic-of-the-day' film! Rather, so it seems to me, every once in a while film history tends to spit out little gems of filmmaking whose greatness relates to these films' essential untimeliness. These are films that may appear to be speaking directly to the Zeitgeist haunting the moment of their release; upon further analysis, however, these are films that even at the moment of their initial emergence affect viewers with the kind of force that is impossible to define at the time of first reception because, though affectively sensible, it remains essentially a force of the future-a force the effects of which still await the conditions of their full actualization at some moment still to come; yet we cannot help but sense that this force, untimely as it may be, nevertheless received its first, prescient and precise, diagnosis in form of the very images and sounds our eyes and ears, indeed our bodies and minds, just encountered. Yella is just such a cinematic gem. Marco Abel teaches film studies and continental theory in the English Department at the University of Nebraska. He is the author of Violent Affect: Literature, Cinema, and Critique after Representation (U Nebraska P, 2007). He is currently researching various projects dealing with German cinema after 1990 and especially focuses on the cinema of the Berlin School. Some of his essays on contemporary German cinema and interviews with directors associated with the Berlin School can be found in Cineaste, Senses of Cinema, and Quarterly Review of Film and Video.